I love Monza. The speed, the setting, the famous bends, the history, the tifosi, everything combines to make it a great occasion, whether or not the race is processional. Watching qualifying is a joy to me, therefore, and today's sessions did not disappoint. The format may be artificial but the resultant tension as "the cut" approaches is real enough. If truth be told, there were no great surprises, most drivers slotting into their accustomed places, McLaren taking the top spots as testing and practise had suggested, Alonso in pole position and making it look easy. The first minor upset was Heidfeld stealing fourth from Raikkonen at the last and even this was not unexpected, given how well the BMWs have been going on this circuit. But Nick continues to be the sole member of the old guard who is clearly better than his much-hyped young team mate; perhaps one day it will be generally recognized that he is one of the best drivers out there. The rest of the top ten were the usual incumbents, Kovalainen, Rosberg and Trulli leaving their team mates trailing, but who would have expected a Honda to creep into the club? 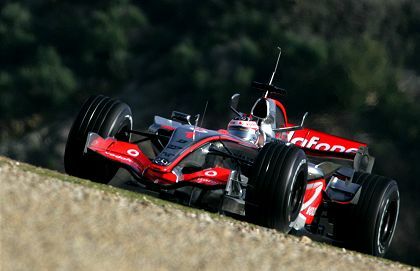 There in tenth spot sits Jenson Button, at last able to get the most out of a car that has been a dog all season. Mark Webber must be a bit annoyed to be dumped down to eleventh from his customary seat amongst the big boys. Barrichello confirmed the performance of the Honda here by grabbing twelfth and Anthony Davidson once again was the quicker of the two Super Aguri drivers. One can only hope that Ant's luck in the races begins to turn and that he reaps the reward due his hard work at last. Vettel looked good in the Toro Rosso in the first session but had reached the limit of the car's potential in the second; he faded to sixteenth on the grid. For a while he had run with the Red Bulls but, before getting excited, we should remember that Speed did that all season without anyone being particularly impressed. The bad luck guys were also the usual culprits, Coulthard prevented from improving by a spin in Q1 and Ralf inexplicably unable to progress from there either. No doubt both will do their overtaking in the race but, starting from so far back, their chances of finishing in the points must be almost non-existent. And there we have it. Predictions for tomorrow? Well, I'll go the obvious route and say a McLaren one-two with Alonso in front. Behind them will come the Ferraris but I reckon Heidfeld might just squeeze in between them this time. Whatever happens, that should be an interesting battle between the Italian and German cars. Qualifying has become as regular as the races ......... BORING. When one car is 'out of place', Heidfeld and Kimi swapped places this time, it becomes an issue worthy of note. Button made it to Q3 ...... hurray for Honda! The mid-field bunch, no surprises and what about that new B-spec Spyker, that really made an impact. Four more races and I can't wait for the agony to end. Already sites and fans are speculating who will drive for whom next year, will ProDrive make a difference, will banning traction control really change anything, can ANYTHING break the tedious boredom?